A nonprofit organization typically obtains financial resources from a variety of sources to carry out the purpose for which it exists. If those financial resources disappear through even honest mistakes let alone purposeful misuse, everyone suffers. When an officer or member steals from the organization he or she swore to serve, would-be volunteers steer clear of it; donations decline; services are negatively affected, and, in worst-case scenarios, sometimes it is shuttered. It goes beyond the person, the organization, and people who benefit from the organization. It hurts all nonprofits because of the violation of trust. All Volunteer Organizations (AVOs), in particular, suffer the most as nearly all do not have paid staff to oversee bookkeeping and day-to-day operations, and therefore are reliant upon people from the community who may or may not possess the particular skillset needed to monitor operations. Steps can be taken by volunteer fire companies, churches, parent-teacher organizations, youth athletic leagues, student clubs, and other nonprofit entities to mitigate their risk of errors and exposure to the theft of funds and/or services. Any lack of oversight is not fair to the organization, the community members it serves and, actually even the person who has volunteered to be the sole guardian of the organization's money. It is vitally important for nonprofits – no matter the size – to implement some simple internal controls. 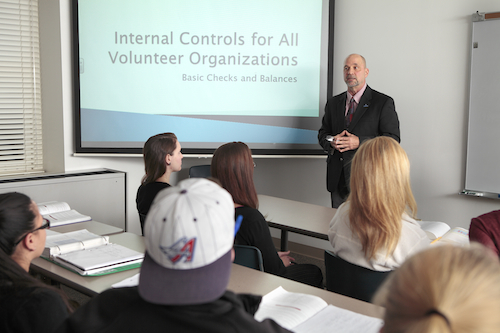 The faculty and the students of the Business Department at Misericordia have put together this resource entitled the Misericordia University Internal Controls and Federal Tax Exemption Basics for All-Volunteer Organizations Resource Manual. As much as possible, the information, guidelines and recommendations contained in this resource are provided and explained in language designed for those with little or no background in accounting or finance. Examples and templates are included where appropriate. You will find information on how to access additional resources available on the Web and in print. Basic Internal Controls that every All Volunteer Organization should have. Download a complete Misericordia University Internal Controls and Federal Tax Exemption Basics for All Volunteer Organizations Resource Manual in .pdf form here. Note: This site is intended for the use of All Volunteer Organizations (AVOs) that have no employees and typically have no physical office space available for exclusive use. The controls recommended have been designed for AVOs and in some cases would not be appropriate for larger nonprofit organizations. It is strongly recommended all nonprofits in Pennsylvania consider joining the Pennsylvania Association of Nonprofit Organizations (PANO) that makes available to its members numerous excellent resources and training. The cost of membership in PANO is determined on a sliding scale based upon the size of the organization. The following accounting students at Misericordia University have contributed to this project facilitated by Dr. Fred J Croop, CPA, CMA, MBA, Professor of Business: Samantha Baloga, Kevin Fitzgerald, Taylor Miller, Tia Miller, Linda Murphy, John Olenik, Nadine Pocceschi-regis, Merissa Reap, Sara Hogan Rutt, and David Smolsky. Many thanks to the practicing accountants who were kind enough to be interviewed by the students and shared their expertise: William D. Durkin, Thomas Felver, Ray L. Knaub, Jr., Brain T. Kelly, Barbara Sanders, and Michelle Valenti. Finally, special appreciation also goes to Misericordia University professional staff members Jennifer Drouse, Stephen Filipiak, and Paul Krzywicki along with Standards for Excellence Director at the Pennsylvania Association of Nonprofit Organizations, Tish Mogan for all they have done to support the project. Fred Croop is available to speak to All Volunteer Organizations or other groups about the importance of implementing internal controls and safeguards in AVOs. Contact him at fcroop@misericordia.edu or (570) 674-6327.